Car hire at Malaga Airport - BOOK NOW and Pay on Arrival, Without Cancellation Fees! Thank you! I've spent another great holiday in Nerja. I'm coming back in a few weeks and will use you again without hesitation, I will recommend your services to all my friends. Our car rental agency just works with top car hire companies based at Malaga Airport. We refer a huge amount of new customers to those companies, so they provide us preferential treatment, therefore, our prices are unbeatable. We know that every pound counts, that's why we work really hard to provide the cheapest car hire at Malaga airport over the internet. Sometimes, traveling can be very tiring, especially when you take a flight. You deserve a professional service, and that's exactly what we offer. Once you arrive at Malaga airport, you will be driving your car in less than 20 minutes. Get rid of worries and enjoy driving a brand new car on the Costa del Sol, our company is fully licensed and authorized to provide car rental at Malaga airport. Don't leave it to luck! You can stop comparing car rental rates, you will be delighted by our friendly and professional service. Check out our prices and you will see that we have the best Malaga Airport car hire rates. We are a car hire broker for all the top companies that are based in Malaga and our large volume of business means that we can offer low cost car hire at Malaga airport. 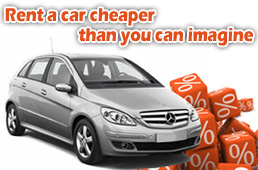 Find your ideal car in Malaga, feel free to browse our last minute offers and save on your next car hire in Malaga.